The Market Place Christmas tree has now been replaced with a better specimen in time for tonight’s Christmas Extravaganza. 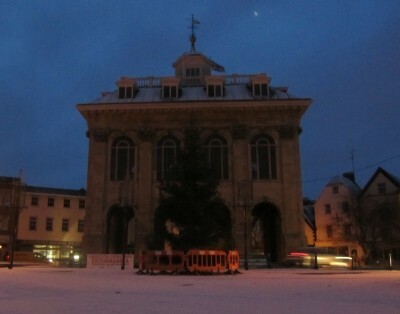 The first tree did make the news, but the really big story coming out of Abingdon in November was whether a Royal wedding bun throw would go ahead – given there might be no roof on the County Hall for dignatories to throw from. 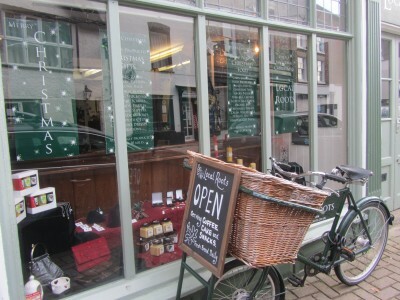 It started at the Abingdon Herald, then went to Radio Oxford and ended up getting more headlines than any real bun throw ever would – even getting featured on Radio 4. No sign of building work above ground yet at the Old Gaol but they were going to start with the underground carpark. Economic recovery is still uncertain. House prices have fallen for the 4th or 5th month. 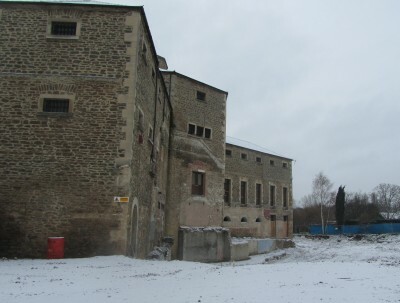 So will development of the Old Gaol slow down awaiting an economic recovery or push on now they have begun? 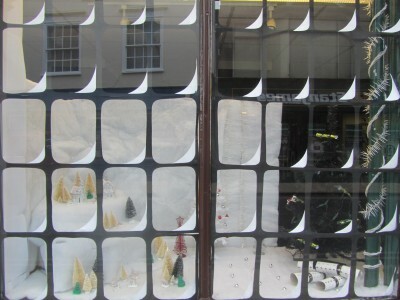 but some shop windows in Abingdon – like Smiths the Chemist - have experienced heavy snow. 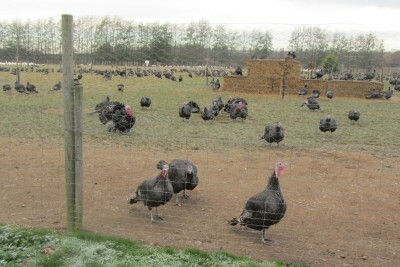 and Geese come from just up the road at Peachcroft Farm in Abingdon. Amnesty International were on the Market Place encouraging people to send cards to prisoners of conscience. On the Market Place, Dunmore playgroup were selling cakes to raise funds. 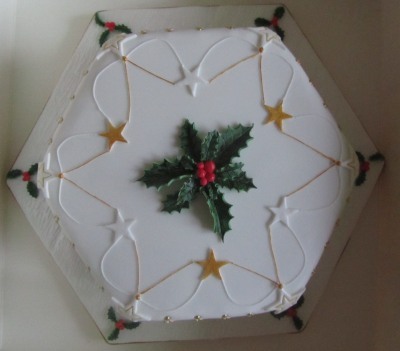 So rather than buy a cake I just entered the competition to guess the weight of the Christmas Cake. 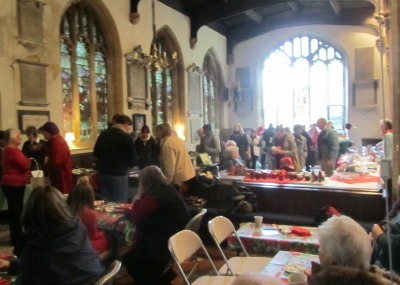 Both the Salvation army and St Helen’s Church had Christmas Bazaars this morning. 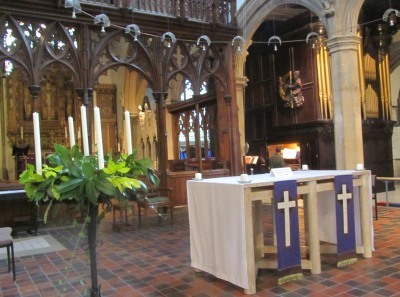 At St Helens I remember having a go on the raffle and talking to various people and I must have also had a go at guessing the weight of their Christmas Cake. 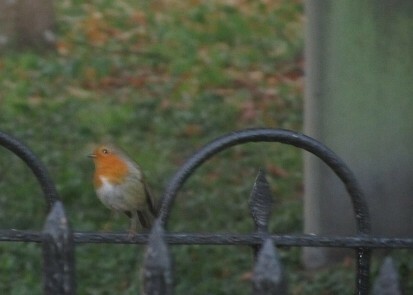 I looked at the advent crown on the way out. First candle gets lit tomorrow. Some time later I got a phone call that I had guessed the right weight. This wondercake from St Helens is the result. 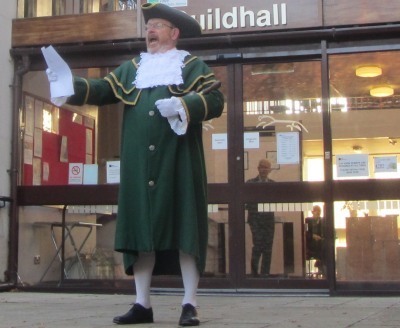 The Town Crier was outside the Guildhall to welcome teachers and Year 7 students from John Mason School. 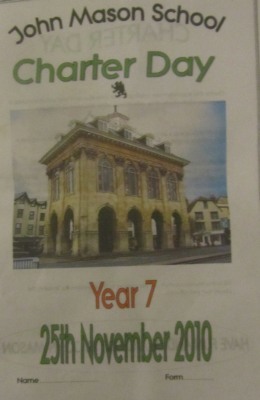 Every year Year 7 comes to the Guildhall to learn about some of Abingdon’s important buildings and some of their history. 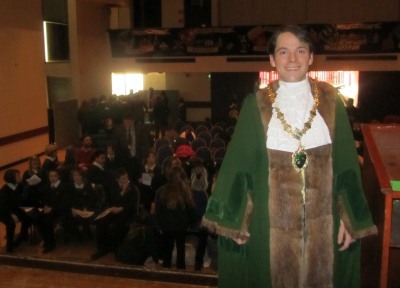 The Mayor, Duncan Brown welcomed everybody, then the students split into 9 different groups, and were taken on a tour of 9 different locations in the Guildhall itself, the Abbey Buildings, St Helen’s Church and the almshouses. The Mayor held court in the Guildhall’s Council Chamber, an oak panelled room rebuilt in 1733, where he entertained the students with a talk that began with the picture of Mad King George III who lost the American colonies … looked at many other seemingly uninteresting pictures in a fun way … discovered a statue outside riddled with civil war musket fire … and ended with a picture of the town council in 1878. The students had to say what might have changed between 1878 to 2010. For a start the council in 1878 were all male, looked elderly, sported a lot of facial hair, and did not smile. I have a copy of the leaflet and questionnaire the pupils carried round during the morning. It says at the start “Have fun and be a credit to John Mason“.